In talking electoral strategies, there is just one state exactly tied in the RCP average, and that is Virginia. Been tied since Saturday. Despite the fact that the FHQ weighted average formula does not reflect it, I am sympathetic to the notion of the state of Virginia being if not tied, then very close to it at the moment. As FHQ has mentioned over the last several days the polling in the Old Dominion has been back and forth in the time since the first debate in Denver. 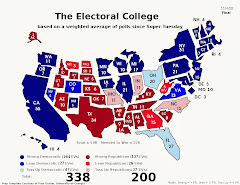 But if we are talking electoral strategies, Virginia being the closest state on November 6 translates into an Obama reelection considering the order of states that has been established based not only on historical precedent but also via state level polling throughout 2012. 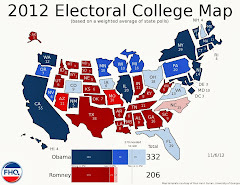 If the partisan line -- the line separating both candidates' shares of states -- is drawn on the Obama side of Virginia (see the Electoral College Spectrum below), then that is enough to get Governor Romney to 257 electoral votes, but pushes Iowa, Ohio and New Hampshire into the president's column and additionally hands him victory with 281 electoral votes. 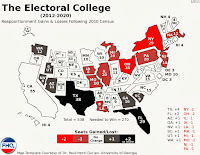 Where this potentially breaks down is when states are very closely jumbled together as it appears some or are now in 2012 or when there is late-breaking but insufficient information to predict a swing toward one candidate or another. Looking back four years ago, for instance, the FHQ averages correctly identified that Indiana, Missouri and North Carolina were a distinct cluster (and all on the McCain side of the partisan line), but did not get the election day order right. 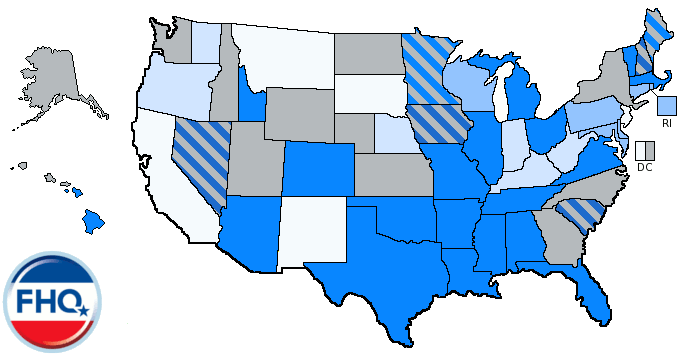 The best example of a state where late information changed the positioning in the order is Nevada, where signs late in the race four years ago pointed to a wider Obama margin, but there was not enough data to move the averages enough to reflect the reality on the ground (...though the Silver state did move out of the toss up category in the very last election day map). All this is to say that the order of states is pretty well baked in two weeks out from election day. Given the information we have gathered to this point in the race, if Virginia is tied or if Romney wins the commonwealth by one vote, then it will not be enough to get him north of 270 in the electoral vote tally. However, if the post-Denver compression of the average margins continues it could -- could -- disrupt the tiers of states that have formed. Right now there is a very clear Virginia/Colorado/Florida tier (Tier 1), a New Hampshire/Ohio/Iowa tier (Tier 2) and a Wisconsin/Nevada tier (Tier 3). If Tier 1 leans to Romney and Tier 3 leans to Obama, then the next two weeks in New Hampshire, Ohio and Iowa will be a lot of fun. ...or something less than fun to anyone who is not counting electoral votes. 1 If the election was held today. It feels to me like there are more question marks that could disrupt the order this time around. What if polls are underestimating Latino turnout, for instance? Your whole tier 1 could shoot past tier 2. If it's African-American turnout, then Virginia could move up. If there's a huge Mormon surge, then Nevada and Colorado could move without the others. If something with the auto bailout proves decisive, Ohio could move without the others. Something to do with Medicare could move Florida more than the others. This is not an election cycle of big themes; micro-targetting is the order of the day. Under those circumstances I'm less confident the order will fall the way it now appears in the polls.